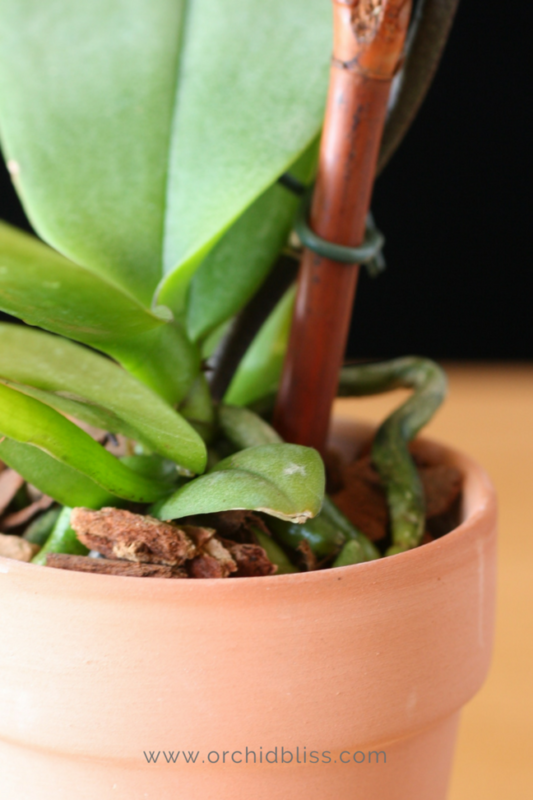 Knowing how to re-pot an orchid is an important part of orchid care. In this step-by-step guide, I walk you through the whole process. Repotting an orchid has several benefits. 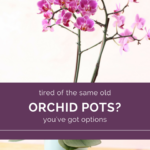 It gives you a chance to toss a low-grade, mass-produced potting medium in exchange for a top-grade potting mix to help ensure optimum orchid health. It also will eliminate salt build up that has accumulated through fertilizer. Any slugs, snails or other undesirables that may be lurking in the potting medium, will be tossed out. 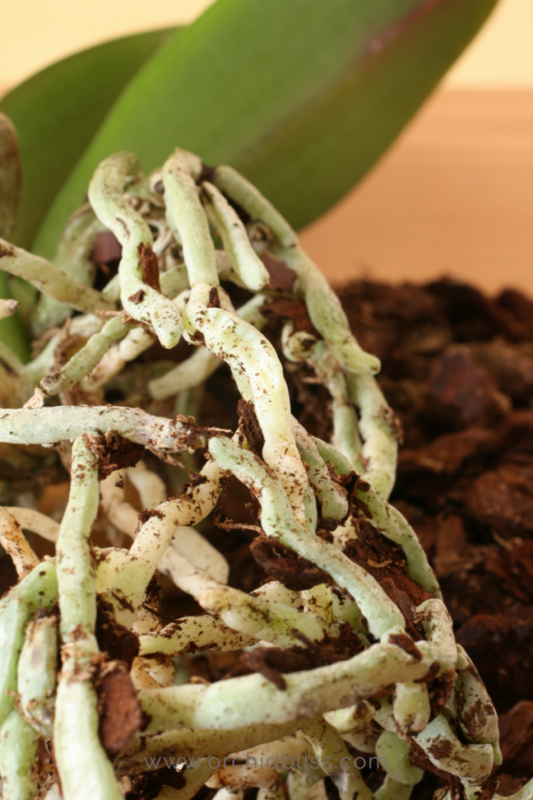 You will also have the chance to inspect the health of your orchid’s roots. The roots will tell you if you are over- or under-watering. Every one to two years is a good time to pot an orchid. Before the potting medium breaks down. As the wood chips begin to decay and breakdown you will see fine pieces of wood float to the top of the water-think coffee grounds. Best practice is to re-pot before the potting media breaks down. When the orchid has finished flowering and the blooms have all dropped. Why ruin a good thing? You risk losing flowers if you re-pot too soon. After you’ve read my post on when and why to re-pot orchids. 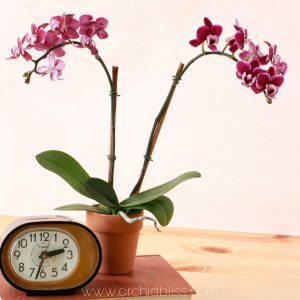 This post gives essential information on when you should re-pot your orchid and why you should do it. TIP: The exception to repotting is the Dendrobium; they do not like to be repotted. Know that if you re-pot one of these guys you risk losing your plant. 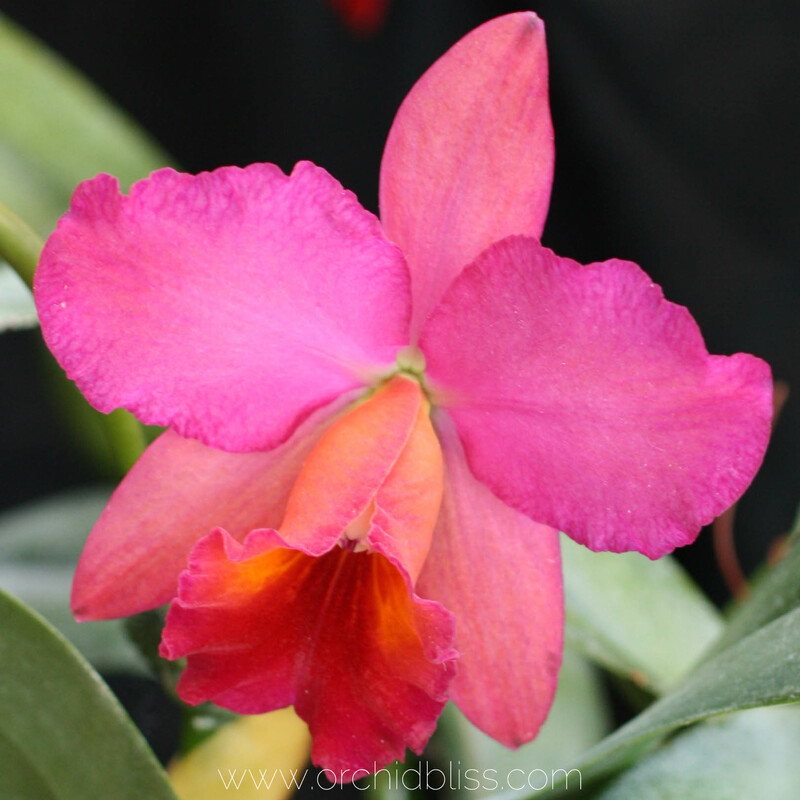 Before potting, determine if you have a monopodial or a sympodial orchid. It is important to make this distinction before potting as it will make a difference when potting your orchid. 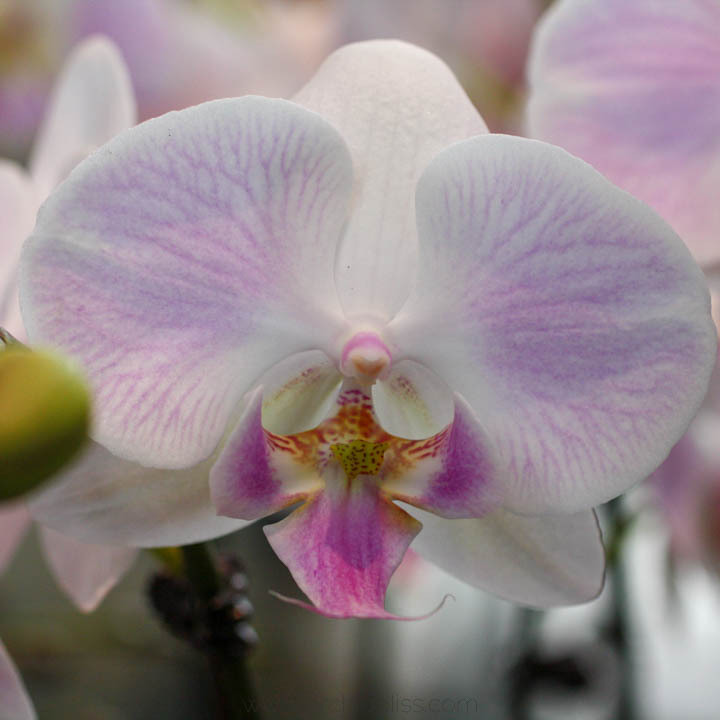 If you have purchased your orchid from the grocery store, you likely have a Phalaenopsis orchid, nicknamed the moth orchid. This type of orchid grows from a single stem. Out of this stem grow the leaves, flower stalk, and roots. Phalaenopsis and Vanda orchids are monopodial. The Phalaenopsis orchid is monopodial and grows from a single stalk. Most other orchids are sympodial. This means that they grow along a rhizome. These orchids are easy to recognize because most of them have pseudobulbs where they store water. One notable exception is the Paphiopedilum, also known as the slipper orchid. Some people mistakenly believe that it is monopodial, but it is sympodial. Despite not having pseudobulbs the Paphiopedilum grows along a rhizome. Large, fleshy bulbs signify pseudobulbs on this Brassia orchid. The slight bulges along the stems indicate pseudobulbs on this Dendrobium. Similar pseudobulbs grow on Cattleyas. 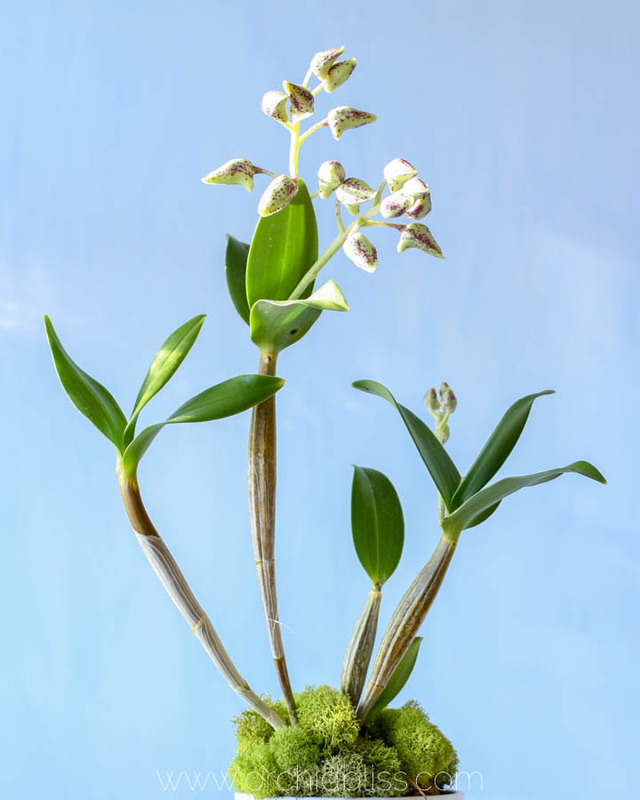 Here’s why it’s important to know the difference between monopodial and sympodial orchids when potting: Monopodial orchids will be placed in the center of the pot, so that the orchid can continue to grow upwards. By contrast, sympodial orchids will be placed with the oldest growth placed against the edge of the pot. The new growth will be set towards the center of the pot. Sterilized pruning shears, carefully wipe scissors down with rubbing alcohol to sterilize, or use a butane torch to sterilize. Pass the ends of the shears through the flame. New potting media. 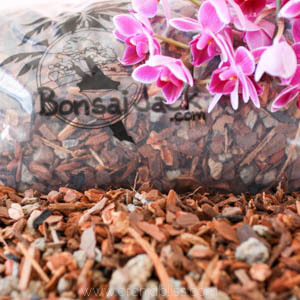 If you are potting a Phalaenopsis, Oncidium, Cattleya or Dendrobium, this is the potting mix I recommend: Bonsai Jack Universal Mix. By the way, if you are interested in a list of the top tools I use to repot my orchids, click on the link below. To make the roots more pliable, soak the plant for about 5 minutes in water. Then, ease the plant out of its pot. 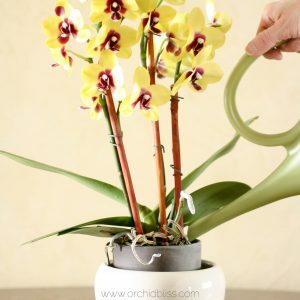 Orchids can become very attached to their pots and removing them can be a little tricky. Cut the plant out of its pot if you have to. This can be easier said than done. Orchid roots will cling to clay. You may have to break the pot if the roots cling too tenaciously. Remove as much of the pot as possible, but it is okay if you leave some of the pot pieces clinging to the roots. To remove roots from terra cotta, just take a razor blade and slide it right under the root and slide it upward close to the pot. I have done it many times, even to remove roots from my walls. If the pot is plastic, you may need to cut the pot to get the plant out. Pick the old planting media from the roots. Do not reuse any of the old planting media. Always use new media. This will help to prevent the spread of disease. 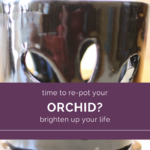 New potting media will also give your orchids a fresh start, without fertilizer salt buildup. Orchids with thin, fine roots are a little more tricky than those with thick roots. 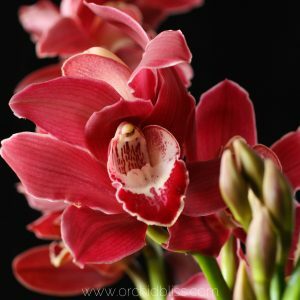 It will take a bit more finesse to tease the potting medium out from finely rooted orchids. With a pair of sterilized pruning shears, trim away any dead roots. These dead roots are easily identifiable because they will be black or mushy. Healthy roots will be white or green and firm. After picking away old potting media from the roots and trimming away dead roots, rinse the roots using tepid tap water. Orchids like to be crowded in their pot. If you do re-pot in a larger pot, use one that is only slightly larger. The orchid will not re-bloom as well, if at all if the pot size is too large, and with orchids, it is all about the flowers! A mature plant can continue to live in the same pot indefinitely, though seedlings may require yearly re-potting. There are many types of planting media to choose from. 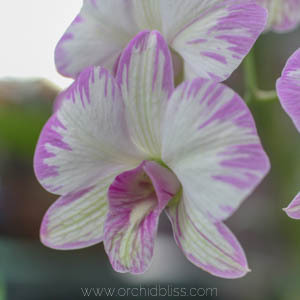 Everything from sphagnum moss to wood chips to coconut fiber, horticulture charcoal, perlite, aliflor or LECA (lightweight expanded clay aggregate), pumice and rock wool can be used as planting media for orchids. I like to use an orchid potting mix sold by Bonsai Jack. This media is composed of 98% Fir bark, 1% horticulture charcoal, and 1% perlite. It is carefully screened, cleaned and tested for pathogens. This potting mix will last 1-2 years. As mentioned above, place monopodial orchids, like the Phalaenopsis in the center of the pot. On the other hand, place sympodial orchids with the oldest growth towards the edge of the pot and the newest growth towards the center. You may be wondering how to tell the difference between old and new growth. If you have a healthy plant, newer pseudobulbs should be larger than the oldest pseudobulbs. As the orchid matures, new pseudobulbs will grow larger than the ones grown the year previous, until the orchid reaches full maturity. Another indication is new leaf growth. Paphiopedilums do not have pseudobulbs, but the flower for the next year will always emerge from the newest leaves. Place the newest leaf growth toward the center of the pot and the oldest toward the edge. Over time, the orchid will continue to grow towards the opposite side of the pot. Begin working in the roots until the base of the plant is at the top. Monopodial Orchids: If you’re potting a Phalaenopsis, place the orchid in the center of the pot. Sympodial Orchids: Place the oldest growth towards the side of the pot and the newest growth towards the center of the pot. Meanwhile, while working in the roots, add potting media. Tap and gently shake the pot to encourage the potting media to settle into the pot. As the crown of the plant prefers to stay dry, it should be above the planting media. Likewise, aerial roots, those roots that are growing out the potting media, should also remain in the air, and out of the potting media. Twist the pot opposite from the plant to help the roots curl into the pot, adding more soil as you go. Tamp and pat the pot to remove air voids. Poke a chopstick around to fill in any gaps. Now you know how to re-pot an orchid. To finish up, write the date on the label and stick it to the bottom of the orchid pot. Lastly, resist the urge to water right away. Let the plant rest a day or two and then water. All done! Very clear instructions. Now I can try to improve my orchids. Thank you . Best of luck with your orchids. Let me know if you have any questions! Yes they will. Some orchid flowers have been dyed–the “gem” orchids you see in the grocery store for instance. When they rebloom, the flowers are usually white, but they are orchids. What do I do about roots that have grown through the holes of an orchid pot? Some of them are quite long (6-8″) Also, some of the roots are quite adherent to the sides of the pot. It is perfectly fine for the roots to grow through the holes. That’s just what orchid roots do. You don’t need to do anything about those roots. And, yes again, orchid roots will stick to the pot–terracotta pots in particular. This just means that when potting your orchid you will need to use extra care. I appreciate your comment so much! It is my goal to be as clear as I can about caring for orchids. I have revisited this post and updated it in an effort to clarify the information. Monopodial orchids (like Phaleanopsis) are potted in the center of the pot, while sympodial orchids are potted with the oldest pseudobulbs potted on the side of the pot, leaving room for newer growth toward the center. When potting an orchid, go up just one size larger. I agree with previous poster, there are still some parts of your instructions that contradict each other, for example in the cursive writing early on when you explain the difference between the orchid types (“Why it is important to know the difference”). I gather it’s the other way round for placement? You also call a Phaleanopsis a monopodial orchid in some places and a sympodial in others. That being said, I found the instructions very helpful once I figured out what is what. Thank you so much for bringing this to my attention. I’ve combed through the post (again) and I think I’ve got it fixed. That’s a great guide. I had no idea orchids liked to be cramped in their pots..! May be the reason a couple of them have stopped blooming/growing. Thanks! It was great to hear from you. Keep in touch. I’d love to hear how your orchids progress. This was news to me too – should I repot my orchids into smaller pots or just let them grow into their existing pots? I’d rather wait to see them bloom than risk disturbing them too much, but would like to know if they’ll still be healthy in a too-large pot? Great question. 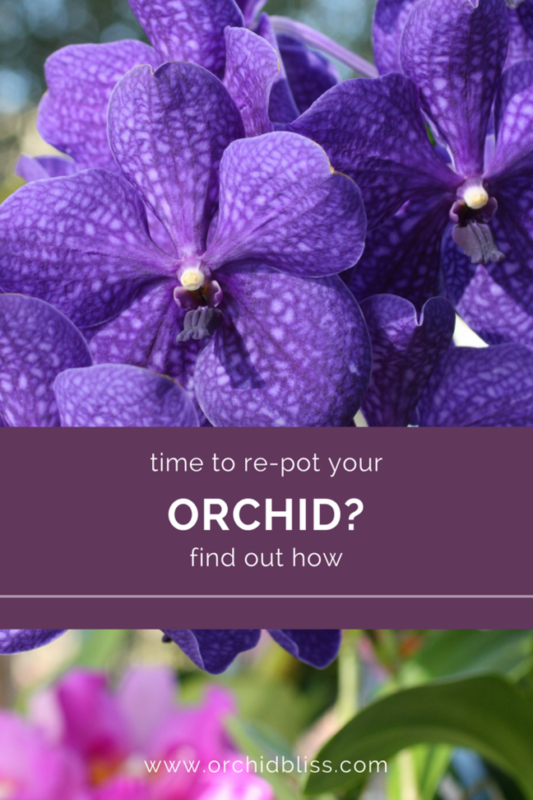 Once an orchid has reached maturity, it can be repotted indefinitely in the same pot. Unless it looks like its climbing out of its pot, it can stay in the same pot. If it does look like it’s climbing out, go up one pot size. For instance, go from a 4″ to a 5″ diameter pot. Thanks for such clear instructions. You’re welcome! Please, let my know if you have any questions about potting your orchids. Do you soak the new potting medium before you replant? Yes, you can soak the medium before potting, Just be sure to let it drain for a few hours before potitng. To encourage new orchid roots to grow into the potting mix, you could repot is once it has finished blooming. Just remember not to pot the aerial roots or to trim them off (only trim away dead roots). Also, after potting expect some recovery time. Sounds like your orchid is doing great–blooming every six months for you! I love that your orchid is blooming twice a year for you! Sounds like you are an excellent care-giver. 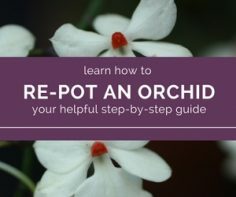 And, thanks for the question about repotting your orchid. Repotting your Phal is a chance to pot your orchid so that the crown sits on the potting mix, rather than a couple of inches above. As you’ve observed, as more leaves grow Phals can get top heavy. 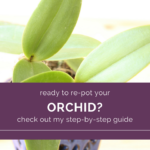 Of even more importance, repotting is an opportunity to refresh your orchid’s potting mix. Over time, potting mix breaks down, inhibiting adequate air circulation to the roots. 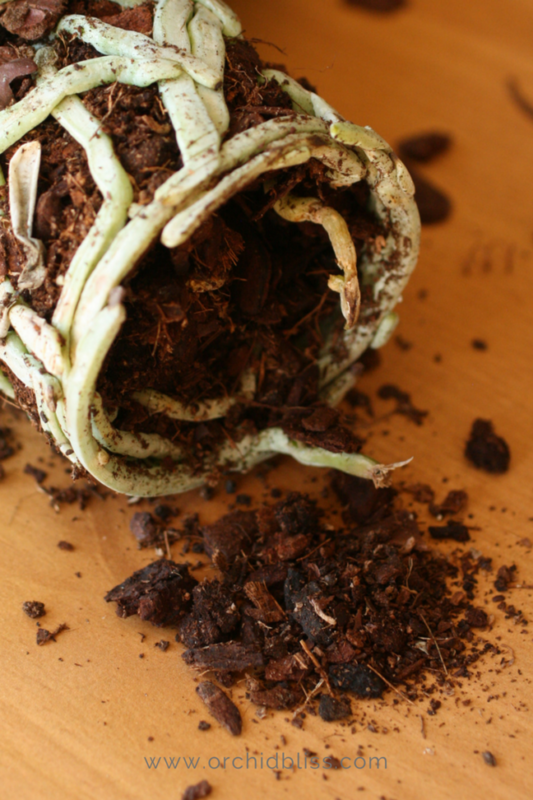 Repotting gives the roots a fresh start with beneficial air flow. My orchid grew an orchid on one of the flower spikes. The parent plant and baby are both blooming so I know I need to wait until they’re done blooming before I do anything, but how do I plant an orchid from a stem??? Before removing your keiki, wait until the leaves and roots are at least a couple of inches long. In fact, the longer you leave your keiki on the mother plant, the better chance that the keiki will survive. Using sterilized shears, cut about an inch above and below the keiki. Loosely pot the keiki in mini orchid potting mix. Be careful not to over water as these roots are used to absorbing moisture from the air. Also… how do I prevent the exposed tissue from rotting after trimming a root? Even if I let it dry a bit and callus over, it seems to start rotting as soon as I get it wet. Your description gave me a chuckle! If the root is bothering you, just cut it off. 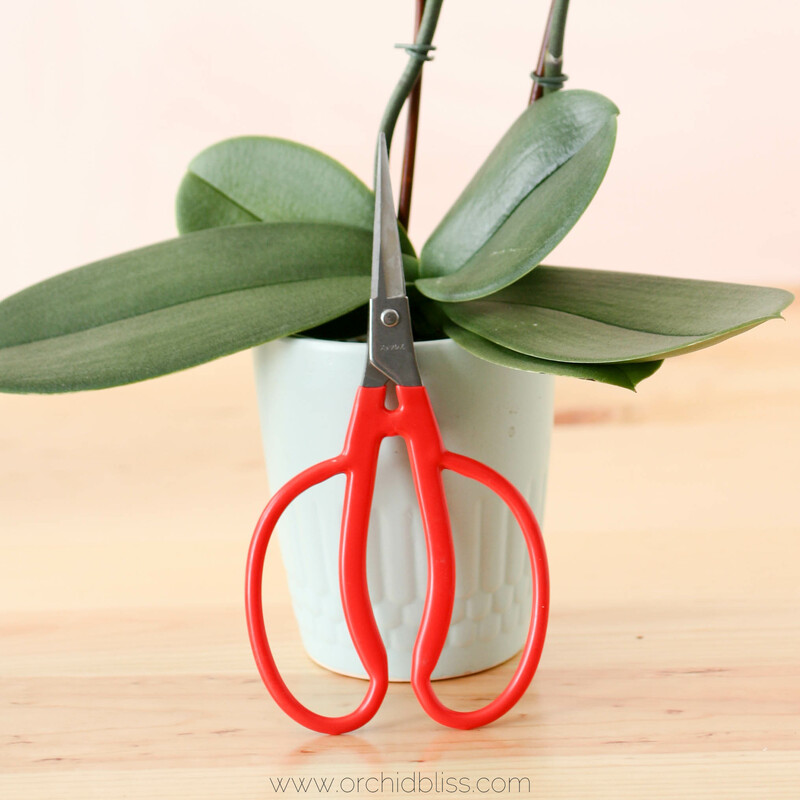 If the orchid is otherwise healthy, removing one root isn’t going to damage the plant. Don’t worry about watering the aerial roots. They are accustomed to getting the moisture they need from the air and will be fine without extra water. Watering from the bottom may help to keep the aerial roots dry, thereby preventing rot on a newly cut root tip. 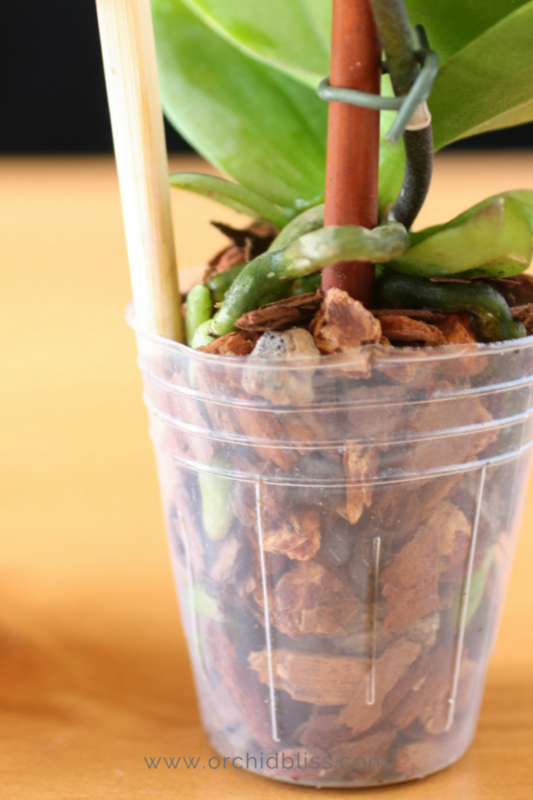 Best of luck with your green bean root growing orchid! i need to repot some of my orchid plants. So, where can I purchase larger plastic insert cups. 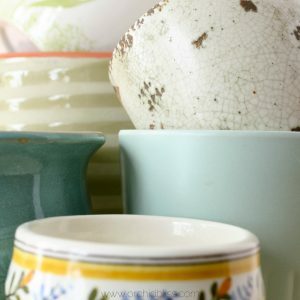 Here’s an affiliate link for large plastic insert cups. At no additional cost to you, I do receive a commission if you purchase through that link. Those are the liner pots I use. I don’t grow Vandas as my growing conditions won’t suit. That said, most growers grow Vandas in wood slotted baskets specially made for Vandas. Potting mix is usually large-size Fir bark. If you live in Florida, or somewhere with a similar climate, you can grow them outdoors, watering the roots daily. Here is a link for Vanda baskets. If you purchase through this link, at no additional cost to you, I will receive a commission. I hope you get some flower soon! It was great to hear from you! Yes, you live in the perfect environment for growing orchids! Have fun increasing your collection! 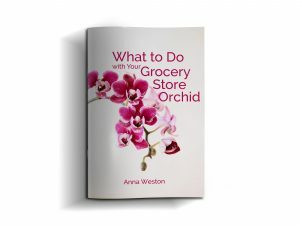 Let my know if I can answer any questions about caring for orchids. I’m always happy to help. I haven’t ever encountered this problem before where the leaves are too heavy. It is quite normal, however, for the flower stalks to become heavy. In this case you can stake the flower stalk with a thin bamboo stake and fasten the flower stalk to the stake with a hair clip. Email me: [email protected]. With a picture and I’ll try to help better answer your question. I have a beautiful phal orchid. The flowers have dropped after about three months. It is potted in sphagnum moss and last night the leaves toppled over. I found the crown had turned black but the leaves were strong and firm and the stem for the flowers is still green. I trimmed the black stuff off and put the leaves in water. Maybe it will root??? Maybe??? Try it if it works bonus if not I will toss it. My question is if the stem is green and the roots are ok will it grow leaves back? Time will tell…Let me know how it goes. 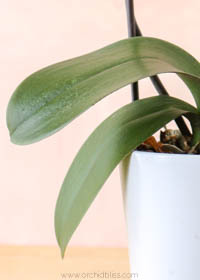 Phalaenopsis are sensitive to crown rot. As a preventative measure, when watering try to keep water from settling down inside the leaves. I’m curious to know if your orchid will grow new leaves. Keep us posted. should my new pot have drain holes ? also can I just use a bigger pot without the plastic insert? As orchids do not like to sit in water, your pot should have drainage holes. 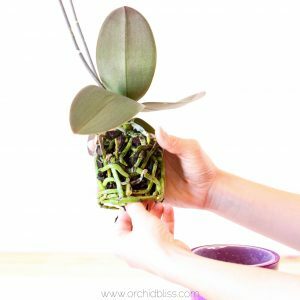 Plastic inserts are nice because they allow you to see the orchid’s roots and the potting media, but they are not absolutely necessary. Also, if you pot in terracotta, which some orchid growers prefer, note that the roots will stick to the clay – which can make repotting tricky. I just repotted 3 Phalaneopsis. I buried the aerial roots in bark medium then watered them. I was not aware of crown rot and aerial roots being left on top. Shoiuld I repot them again and leave the roots on top? While the aerial roots are most suited to being left out in the air, they will be fine potted. I wouldn’t worry about that. About the stem, when watering, just be careful not to let water accumulate in the crown, if possible. Also, if your orchids seem to be drying out too fast you can poke a bit of sphagnum moss around in the mix. 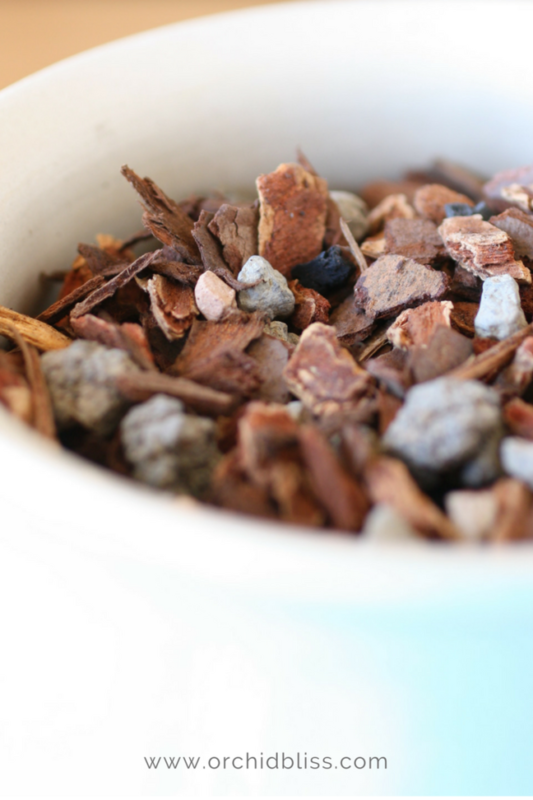 Fir bark is a wonderful, popular mix, that I use myself but it is very fast-draining – especially when new. I love my Phalaneopsis orchids. I have a question about one of my healthy double stem that I’ve had for several years. The plant is healthy in a good size cachet pot with plenty of drainage with loose bark medium. It seems that I have a second quite healthy plant that is now growing beside the original plant. Can I safely separate it out for a new plant? Is it unusual for a Phalaneopsis to grow another plant in the same pot ? 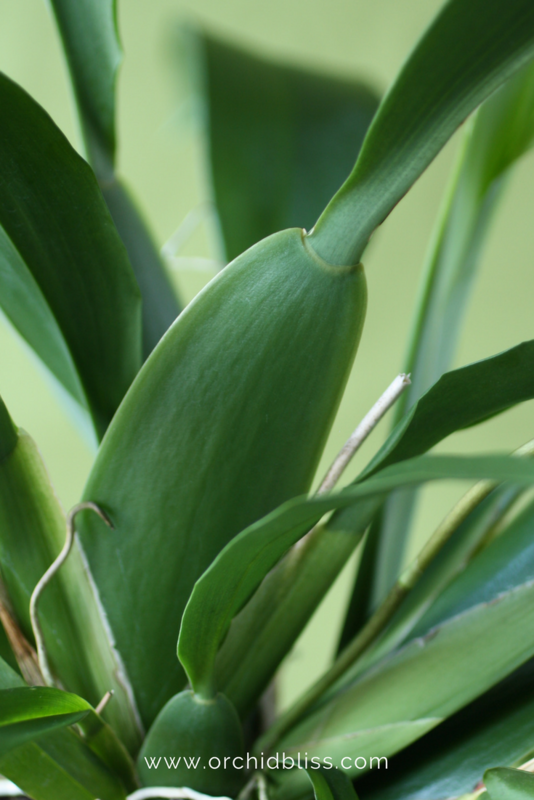 What you have growing is called a keiki – a baby orchid. It is an exact clone of the mother plant. The decision to remove the plantlet is based on whether or not the keiki has its own roots. If it does, you can remove it and pot it up. If it does not have its own root system leave it as-is. 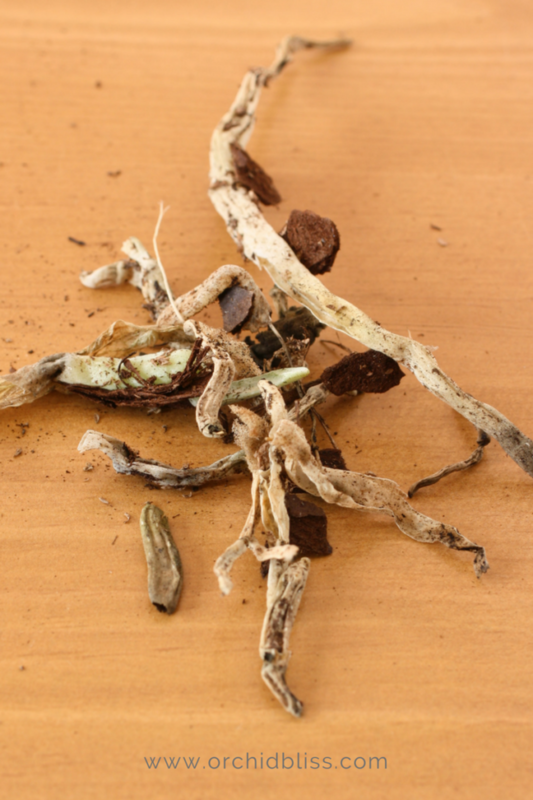 Keikis without their own roots are called basal keikis. These are fun to watch. I have a basal keiki growing a flower stalk right now…so fun. What is the best way to remove orchids from the wooden baskets without harming the roots. They are tangled around the basket. If possible, simply leave the vanda in the old basket and place it in a larger basket. Do not coil the roots around the new basket as these orchids will grow best if their roots are open and unrestricted. To secure the smaller basket to the larger one, wire the two baskets together. If the basket it is in has rotted, you may need to remove the wooden basket. Here’s what to do: soak the roots in water for several minutes. This will make the roots more pliable. Since the roots are tangled around the wooden basket, you will need to take the basket apart. 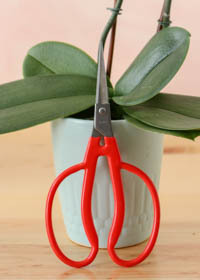 If it becomes necessary to cut the roots, be sure to sterilize your pruners under a flame or with rubbing alcohol. If you can simply place the smaller basket inside a larger one, the roots will be less disturbed than if you have to dismantle the basket. I received an orchid as a gift. The plastic container has no holes for drainage, but the plant is covered in blooms so re-potting now doesn’t seem like the right thing to do. Should I poke holes in the current plastic pot until time to repot? Yes, cut some holes in the plastic pot. Without drainage, the orchid’s roots will rot.